Compass Associates were delighted to attend the Hallmark Care Home Awards on Friday 16th September at the beautiful Beaumont Estate in Windsor. 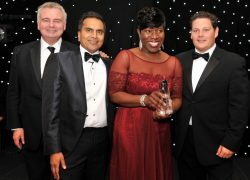 Compass Associates were proud to be sponsors of the General Manager of the Year award category, which was won by Yetty Adepegba of Kew House, presented by Compass Associates Director Mike Jeffreys and Eamonn Holmes. Quarter 2 Charity Day for Endometriosis UK! On Friday 26th August, Compass Associates held our Quarter 2 Charity Day raising money for a charity close to two of our employees’ hearts; Endometriosis UK. The condition affects 1 in 10 women in the UK the cause of which is unknown and currently there is no cure. The usual Bake Off was well received with a huge array of sweet and savoury treats. In Manchester, Rebecca Taylor baked her way to victory with mini chocolate chip muffins.